Del has developed a number of programs specifically for corporate clients. These programs include sessions in personal leadership, time management, delegation, and motiviation. If you are planning a half-day or full-day training program for your staff, you might want to consider also using some of Del's award-winning programs in Leadership Development. All of these areas overlap, and you may find the perfect programs for your staff listed under those programs. Del Suggs has a Master of Science Degree in Instructional Design and Development, and has served been an instructor at Florida State University in both the College of Education and the College of Music. His programs are generally accepted for Continuing Education Credits for most professional organizations. Del can design specific programs to meet your needs. Please contact him directly for more information. Insight Publishing is pleased to present Del Suggs, Dr. Ken Blanchard & Dr. Deepak Chopra in an exceptional compilation of resourceful people who will tell you how they learned how to be successful.It is available from Del here at his store. Roadmap to Success is a mini-seminar on how to plan for your success. The successful people in this book have the experience that will help you find what you need to create your road map to success. These perceptive businesspeople are fascinating as they unfold their own personal road maps and tell of their various success journeys. 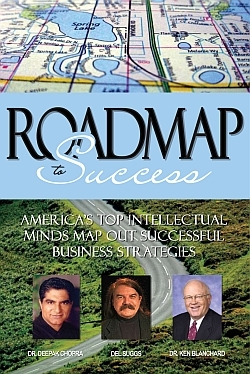 You can also purchase Roadmap to Success from Amazon.com.